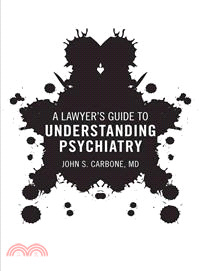 A Lawyer's Guide to Understanding Psychiatry focuses on providing a basic understanding of, and working familiarity with, the situations and terminology lawyers encounter in dealing with patients and clinicians. This information enables lawyers to frame better questions and more precisely identify facts pertinent to the case. Dr. John Carbone has over 23 years of experience as a practicing mental health provider, specializing in general and forensic psychiatry. In addition to his leadership role as Chief of Psychiatry and Director of Mental Health Services for the North Carolina Department of Public Safety in Raleigh, he has been appointed by Governor Beverly Perdue to serve on both the North Carolina Mental Health Commission and the Council on Developmental Disabilities.